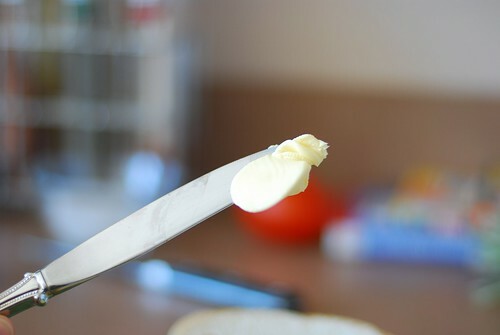 how about doing this with mozzarella? make it all nom-nom-ish melty. YUM! 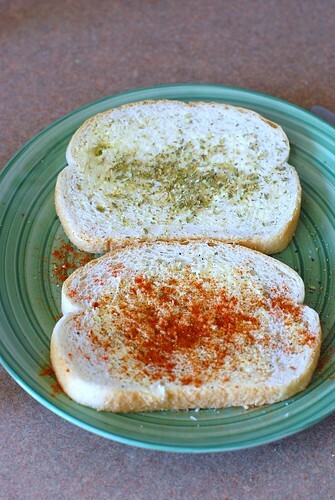 I love putting spices on grilled cheese, but have always put them on the outside of the bread, after buttering it – I think I need to try it this way! my favorite combo is cayenne and black garlic pepper with cheddar cheese. 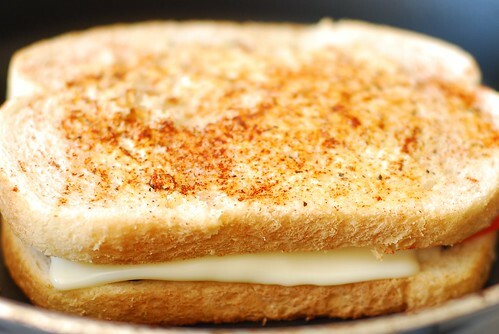 Your grilled cheese looks amazing! 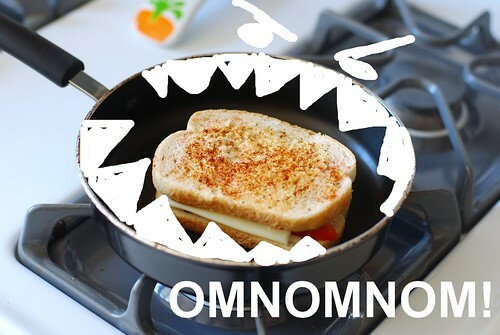 Thanks for the fun pictures too; your Omnomnom picture made me laugh out loud. Oh, yeah! A grown up grilled cheese. Look delish! 2 slices is hardly enough for a real grilled cheese. I love to put dill pickles slices in my grilled cheese. 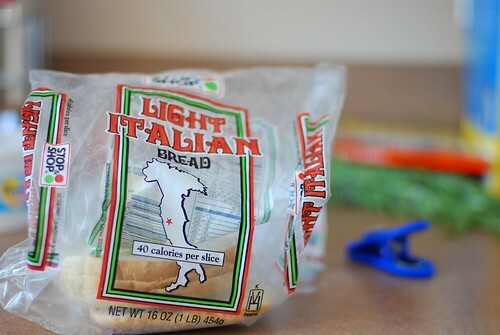 Try it, it’s delish! My fave is caramelized onions and just a smidge of whole grain mustard. YUM! 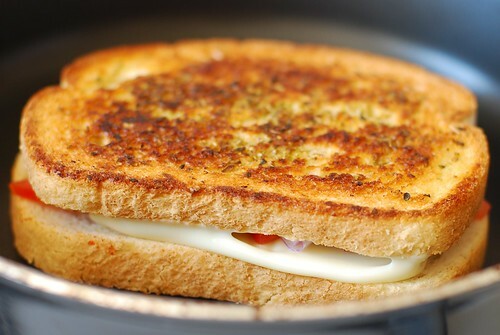 My favorite addition to a grilled cheese is cream cheese mixed with crushed garlic and chipolte peppers. I bet that would be amazing with all of those spices. Yum. 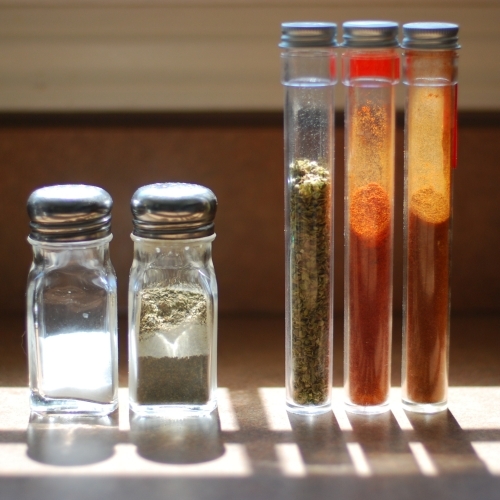 I like the addition of spices…I’ve never done that! Love the sandwich-building animation, too. not sure if this really counts as a grilled cheese, but our dinner sometimes consists of the same sandwich with a fried egg in the middle. I add salt and pepper, but some extras are a nice idea! OK — you’ve totally convinced me. I’m a grilled cheese devotee, but I’ve never had them quite this way. Everyone has such great ideas! Thanks for sharing, dudes! That looks the best grilled cheese ever!! Ha, I love the animated pic. I just ate but now I’m craving grilled cheese.